The materialization of a creative interaction with a poem through translation reveals how reading a poem is a plurilingual, as well as visual, experience which allows the translator to re-visit and inscribe past readings and other sensorial experiences. 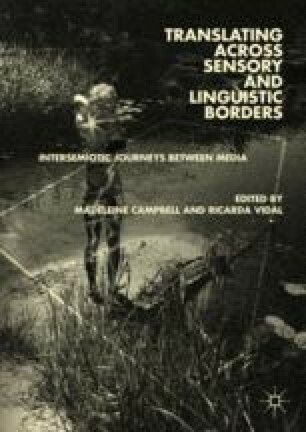 This chapter initially engages with the notion of intersemiotic ‘translatability’ of the poetic form, by examining principles of visual poetics. Successively, the phenomenological nature of the reading experience is explored with an experimental translation of “Tramonto” (Sunset) (1916), a three-line composition by Italian poet Giuseppe Ungaretti, into three digital images. These eventually form a physical object, a triptych entitled “Sunset Triptych”. Observations on these translations attempt to assess the importance of the role of multimodality and intermediality in literary translation. Prohm, Alan. 2013. “Resources of Visual Poetics.” https://alanprohm.wordpress.com/resources-for-a-visual-poetics-prohm/. Accessed August 21, 2017.